The Main Hall at the Village Hall Norbury is a fantastic space – it is 18 metres long by 9.75 metres wide excluding the stage area. It has doors that open to a large paved patio/terrace area with stunning views of the Shropshire Hills. The main hall has wood flooring which is a great surface for dancing and indeed hosts a very popular Zumba class on a Wednesday night. The image was taken at a recent party hosted in Norbury Village Hall where the hall is set up for 70 people, however, it can comfortably seat double this number. With so many windows this is a bright and inviting space, however, a cosy and atmospheric atmosphere can be easily created with lighting. The main hall has full air conditioning (for hotter days) and central heating which heats the hall up quickly. The hall temperature is managed through a control panel by the entrance door. If you are hiring the hall you also have access to the kitchen and your hall hire fee includes the use of equipment including crockery and cutlery. 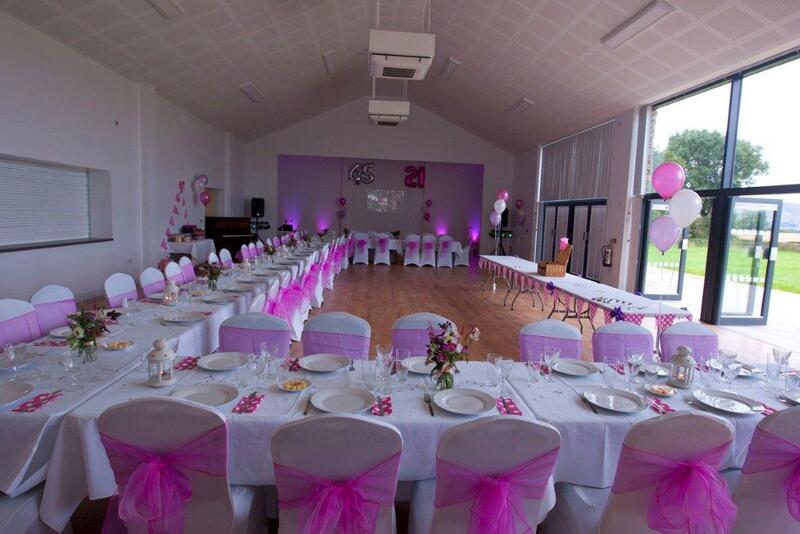 Your hall hire fee also includes the use of tables and chairs (the chair covers and table clothes in the image are not included). To book the Village Hall at Norbury, Shropshire please call 01588 650242 or email hello@villagehallnorbury.co.uk.